Häagen-Dazs™ have been making ice cream like no other since 1961. Our founder, Reuben Mattus’ vision was to make the most extraordinary ice cream the world has ever tasted, a spoonful of luxury to escape the everyday. And to get there he only used the highest quality, carefully selected ingredients. As Reuben said, ‘If you’re like everyone else, you’re lost’. So we make an ice cream like no other – the best that best can be. extraordinary shops inspired by that very space. All over the world, you can indulge in 24 flavours in a setting as extraordinary as the ice cream itself (almost). But what makes our shops extra tempting is the unique selection of seasonal specials and over 20 enticing ice cream creations and drinks. You won’t find them anywhere else. Serving extraordinary scoops since 1976. We set our own trends. And our own standards. Reuben’s devotion to the highest quality changed the way people thought about ice cream. That’s where Häagen-Dazs™ started, and what we stand by today. That means the best ingredients, for the ultimate flavour. Because everyone deserves to experience a spoonful of pleasure. 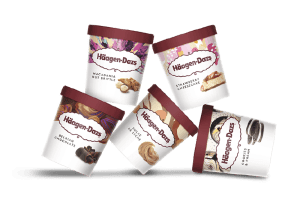 When it comes to ingredients, Häagen-Dazs™ deserves perfect. That’s why every scoop of our ice cream starts with 100% real cream and the freshest French milk (Oh la la). We then blend this with carefully selected ingredients, to create an ice cream with a unique, velvety texture and unforgettable taste. Every spoonful of Haagen-Dazs™ is an absorbing, intensely pleasurable experience, so good that you can’t help but share it with those you love (sometimes). In 1961 Reuben set out to make an ice cream he could be proud of. We are proud to continue his legacy. We make extraordinary ice cream and create extraordinary moments. Because we believe little luxuries have the power to elevate the everyday.